The Goup had the last four days off due to bad weather. The weather hadn't improved, but the war effort needed to continue. 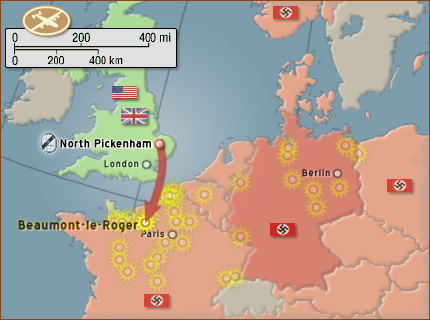 A mission was planned to hit potential German airfields in France. The 492nd drew one at Beaumont-le-Roger. Under the command of Major Turnbull, the Group Operation Officer, 27 planes were dispatched. Of these, 4 of them had to abort due to engine failure. Turnbull led the Group from a Pathfinder plane furnished by the 44th BG. The escorts outnumbered the bombers, so the protection can easily be called excellent. Aside from the 8th Air Force's 632 fighters, the 9th Air Force had over 900 of their fighters flying out and about. We don't believe that the 492nd ran into any resistance, as all ships and crews returned without damage or casualties. Other groups that flew that day did report coastal flak, while the escorts claimed 17 enemy fighters destroyed. The Group was lucky. With little or no visiblity, the Group dropped on the Pathfinder's mark. Of the 23 attacking ships, 3 of them weren't able to release their bombs. According to the report, 2 of them had trouble with their release mechanism and the other excuse was listed as a "personnel problem." The results couldn't be observed or graded. The 492nd was one of the few groups that were able to complete their mission in the foul weather. Weather has always played a big role in war. It affects both sides. It had been almost a month since the infamous D-Day invasion, during which the Allies had secured the beachhead, established a makeshift harbor, run a fuel pipeline across the Channel were pouring in a steady steam of reinforcements and supplies. But they were still hung up in the hedgerows of Normandy. Perhaps the weather had hindered their advance just as much as the enemy did. War movies try to explain the weather's impact, but it also affects the producer's abilities in filming, storytelling and budgeting. Because of that, movies will tend to make references to the bad weather encountered rather than show it. The better generals will try to use bad weather to their advantage. On this day, the 9th Air Force used it to hurt the German forces that were pinned down in Normandy. They also used it as a day to relocate more of their fighter bases from England to France. In Italy, the US 5th Army and 12th Air Force used their bad weather to overrun key German positions that had been hanging them up. But for the Mighty 8th, bad weather days usually meant getting the day off. At best, they could try to take advantage of bad weather by flying Pathfinder-led milk runs across the Channel. The drawback was that the German generals used bad weather days to beef up their home defenses. As bad weather lulls would end, high casualty days would usually follow. For the 492nd, such lulls had already contributed towards them losing the equivalent of two squadrons. This one would cost them another.